Y’sdom was introduced to Sri Lanka (Formerly Ceylon) by Mr. R. O. Buell, then General Secretary of the Colombo YMCA, on his return to Sri Lanka after attending an International Convention in Minneapolis, USA. Thus the first club (Colombo) began functioning in 1929 and was chartered on 3rd December 1930 with the late Sir Oliver Goonetilleka, former Governor General of Ceylon, as its charter president. 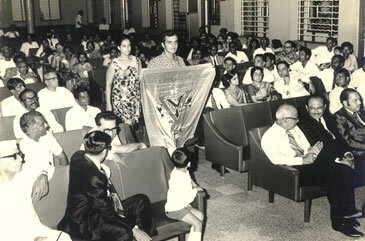 The last occasion when Colombo Club flag was displayed in India. Through the Colombo club, Y'sdom was introduced to India where it spread rapidly and as a result, the India-Sri Lanka Region came into being. Today, the Y’s Men’s Club of Colombo has the distinction of being the oldest functioning Club in Asia. It may be also mentioned that in 1973, Colombo was the first Club in Asia to admit women as fully fledged members and Ms. Sylvia Perera was the first Lady Y’s Man to be inducted. With the charter of 5 more clubs -Kandy (28th July 1962), Moratuwa (30th March 1964), Amparai (November 1964), Jaffna (30th October 1971) and Badulla (1974), representations were made to International Headquarters for Sri Lanka to become a separate Region. Accordingly, at the International Convention in Atami, Japan in 1975, Sri Lanka became a Region of its own with Kenneth Somanader as the first Regional Director (RD). During his office, Kenneth chartered two Clubs, Chavakachcheri (22nd November 1975) and Hatton (March 1976). The first Regional Convention of the Sri Lanka Region was held at the National Seminary, Ampitiya on 10th, 11th, and 12th of September 1976 with a large gathering of over 200 present. Stanley Arnold succeeded Kenneth as RD and during his term, he chartered two Clubs – Welimada (12th February 1977) and Kurunegala (28th May 1977). The 2nd Regional Convention was held in Colombo in October 1977 and Stanly Arnold was re-elected as Regional Director.He was subsequently appointed as an International Council Member (ICM) for the period 1978 to 1981. He was also appointed International Vice President of Asia Area for 1979/80. Stanley was re-elected for a second term in office and continued as RD up to June 1978. During this period, a system of Regional Awards was introduced to spur the Clubs to greater efforts. These awards were presented for the first time at the 3rd Regional Convention held in June 1978 and Kurunegala, the youngest Club at that time was the first recipient of the ‘Best Club Award’. Wimsy Sinnathamby, took over the mantle of office from Stanley and also served as RD for 2 years from 1978 to 1980. He, together with IPRD Stanley and Lady Y’s Man Sylvia Perera represented Sri Lanka Region for the first time at the 53rd International Convention in Melbourne, Australia in July 1978. During Wimsy’s term of office, two Clubs were chartered – Wellawatte (10th November 1978) and Batticaloa (30th May 1980). The first International Brother Club triangle was also established during this period with Aars (Denmark), Arendal (Norway) and Moratuwa (Sri Lanka) combining to form the triangular relationship. The 4th Regional Convention in 1979 was held in Welimada and Moratuwa was adjudged the Best Club for 1979/80. Gladstone Thevathasan took over as RD at the 5th Regional Convention in 1980. During his term , two Clubs were chartered – Manipay (23rd August 1980) and Dehiwala (13th June 1981). Welimada was disaffiliated due to dormancy. Wellawatte won the ‘Best Club’ award at the Regional Convention. Also, though the Regional was barely 5 years old, it was honoured by being requested to host an Area Convention in Sri Lanka. Accordingly, a host Committee was appointed to plan and prepare for the event, with Gladstone as Chairman. International Council meeting – 27th to 30th July 1981. 9th Asia Area Convention – 31st July 1981. Asia Area Council meeting – 1st August 1981. 150 Y’s Men and Menettes from various parts of the world attended the meetings. PRD Stanley Arnold served as an Area Consultant and RD Darrell Perera served as a Councilor at the International Council Meeting. Among the distinguished visitors were Joseph Ohm of Korea who was installed as International President, IPE Max Larson, PIP’s Bruce Price, Christian Bach Iverson and Tod Gunkelman, ISG Bjorn Pederson and International Treasurer Gerald Lee. Fifty years of Y’sdom in Sri Lanka was celebrated during the Asia Area Convention with the Colombo Club hosting a banquet. One of the key issues arising at the meetings was the request by India to secede from the Asia Area and function as a separate Area. This resulted in the “Parting of ways” between colleagues, India and Sri Lanka, with Sri Lanka opting to continue as part of Asia Area. RD Darrell Perera conducted the 7th Regional Convention at the Theological College, Pilimathalawa from 18th to 20th June 1982, where Lanka Nesiah took over the mantle of leadership. His theme for the year was “Reach out to new frontiers”. During his term of office, the ‘Gladstone Thevathasan Fund’ was established with money left over from the 9th Asian Y’s Men’s Convention. The interest earned from this fund was to be used to assist Sri Lankan Y’s Men attend Conventions abroad. The Principles of Partnership between Y’s Men and the YMCA was signed on 18th June 1983 by RD Lanka Nesiah on behalf of the Sri Lanka Region and Eraj Wijesinghe, President of the National Council of YMCAs on behalf of the YMCA. The Kopay Club was chartered in 1983 and the Moratuwa Club was adjudged the ‘Best Club’ for the year. 8th Convention at Pannikuda Bay, Batticaloa on 14th & 15th May 1983 – Best Club - Wellawatte Elected RD Devane Perera.. Hatton Club was disaffiliated during the year. New Clubs chartered were Mt. Lavinia on 24th April 1984 and Kelaniya on 10th June 1984. Unfortunately, ethnic violence broke out in July 1983, and this disrupted the working of most Clubs. 9th Convention at the Sri Lanka Technical Institute, Diyagala Boys Town, Ragama on 12th & 13th May 1984. Best Club - Kurunegala Elected RD Ercon Godlieb..
10th Convention at Sun Island Tourist Village, Kahawa from 7th to 9th June 1985. Best Club – Moratuwa Elected RD George Chinnathamby.. Y’s Ling Shyamila Perera of Wellawatte became the first Sri Lankan student to participate in the YEEP programme in Denmark. 11th Convention at Hotel Thilanka, Kandy from 20th to 22nd June 1986. Best Club - Wellawatte Elected RD Joseph Antonirajah.. Young Moratuwa Club was chartered on 12th May 1987 and Kopay was disaffiliated. 12th Convention at Hotel Mermaid, Kalutara from 12th to 14th June 1987. Best Club - Moratuwa & Wellawatte Elected RD Jackie Ratnam.. The Colombo South Club was chartered on 27th February 1988. Devane Perera served as ASD & ISD and was elected as an International Council Member for 3 years from July 1988. 13th Convention at Hotel Mereviere, Kalutara from 17th to 19th June 1988. Best Club – Moratuwa Elected RD Clifford Ratnavibhusana.. The first entry from Sri Lanka in the Golden Book was made during the year in the name of Kenneth Somanader. 14th Convention at Palm Village Hotel, Uswetakeiyawa from 16th to 18th June 1989. Best Club - Moratuwa Elected RD Jean Godlieb.. RD Jean thus became the first woman in Asia to hold the office of Regional Director. 15th Convention at Palm Village Hotel, Uswetakeiyawa from 15th to 17th June 1990. Best Club - Colombo Elected RD Noreen Chinnathamby..
16th Convention at Coral Gardens Hotel, Hikkaduwa from 14th to 16th June 1991. Best Club – Colombo Elected RD Hilary de Alwis..
17th Convention at Barberyn Reef Hotel, Beruwala from 19th to 21st June 1992. Best Club - Kurunegala Elected RD Elizabeth Dwight..
18th Convention at Barberyn Reef Hotel, Beruwala from 25th to 27th June 1993. Best Club – Wellawatte Elected RD Justin Perera..
19th Convention at Grand Oriental Hotel, Colombo on 18th June 1994. Best Club - Kurunegala Elected RD Rajinda Wijemanne.. Sri Lanka received an invitation to host the Asia Area Convention and allied meetings in 1995. This was accepted and RD Elizabeth Dwight was appointed Chairperson of the Host Committee. 20th Convention at the Town Hall, Kurunegala on 17th June 1995. Best Club - Young Moratuwa Elected RD Ercon Godlieb. Chairman of Central Environmental Committee. The Asia Area Convention took place from 15th to 17th September 1995 at the BMICH with 250 Y’s Men & Menettes in attendance. Dr. Gamini Corea (former Secretary General of UNCTAD) was the . Keynote Speaker. 21st Convention at Club Palm Gardens, Beruwala on 22nd & 23rd June 1996. Best Club - Kurunegala Chief Guest Elected RD Darrell Perera..
22nd Convention – at Subhodhi Piliyandala 21st June 1997. Best Club –Elected RD - V. Manoharan. Y’sling Radhika Hettiarachchi left for Canada on YEEP.in July.. Laid foundation to have an annual Fund raiser, the “Sing-along”. Had the first “Sing-along – Musical Memories-1” at Galle Face Hotel in September. 24th…Convention – Club Palm Bay Marawila. 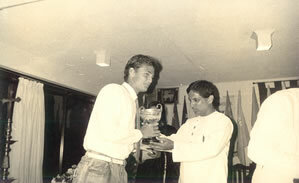 1999 Best Club – Elected RD - Lakshman Perera. 25th…convention – Hotel Camelot Negombo. 17th & 18th June 2000. Keynote address by Dr. Amal Kumarage. Best Club – Colombo Elected RD - Norman De Zilwa. Chatered the Y’sMen’s Club of Nuwara Eliya on 24th February 2001. 26th…Convention - Pegasus Reef Hotel. 2001 Keynote address by pastor Romesh Moraes Best Club – Dehiwela Elected RD - Nilu Fernandopulle. Placed ground work for the formation of Kuliyapitiya Club. 27th Convention – Club Hotel Dolphin. 15th & 16th June 2002. Best Club Colombo– Elected RD - Jayantha Fernando. Chartered the Y’s men’s club of Kuliyapitiya on 23rd of November 2002. Placed ground work for the formation of Mahanuwara and Negombo clubs. Area & International began to respond to an appeal for donations towards the Flood Relief. 28th Convention – Kani Resorts Kalutara. 13th – 15th June 2003. Best Club – Dehiwela Elected RD - Rita Hettiarachchi. Kelaniya Club was disaffiliated due to dormancy.Chief Guest – Area President Janet Siew Guest of Honour IPE John Choa. 22 houses for the Flood Victims were built in Hiniduma and Mandadeniya/Ratnapura areas funded by International & area. The membership training was taken to the door-step of the Clubs for the 1st time. Miss Marilivia came in as a YEEP Student from Brazil. Chartering of Mahanuwara Club on 30th of May 2004 with 20 members took place. Started ground work on chartering the Cinnomon Gardens Club. Training Material on Y'sdom was prepared and transferred to Slides. 29th Regional Convention - Pegasus Reef Hotel. 18th - 20th of June 2004. Best Club - Dehiwela. Elected RD Veraan De Mel." Donations received for Tsunami victims from International, Area and Donors. 30th Regional Convention – Browns Beach Hotel. 25th – 26th June 2005. Best Club – Dehiwela. Elected RD Felician Perera. Chartering of Y Service Club of Cinnamon Gardens with 17 members on 28th May 2005. Colombo the oldest club in the region celebrates its 75th Anniversary on 03rd December 2005. Sri Lanka wins bid to host Asia Area Convention 2009. RD Felician appointed as Host Convention Committee Chairman. Chartering Seeduwa Club on 03rd March 2006 with 16 members. 31st Regional Convention – Lihiniya Surf Hotel 16th – 18th June 2006. Best Club – Dehiwela. Elected RD Anton Kandiah. 15 houses built with assistance from International, Area and donors handed over to Tsunami victims at Weligama. Chartering of the Menettes Club of Athugalpura on 18th November 2006 with 22 Members. 32nd Regional Convention- Hotel Topaz /Tourmaline Kandy. 22nd – 24th June 2007. Keynote Speaker – Mr. Kushil Gunasekera. Best Club – Dehiwela. Elected RD Enrico Brown PRD Clifford Rathanavibhushana has been appointed as the Chairman of Asia Area Convention for 2009. Disaffiliated Seeduwa Club. Ground work was started for chartering Bambalapitiya Club and Batticola City club by DG Ariyaratnam. Chartering of Bambalapitiya Club on 17th August 2010 with 15 members. Chartering of Singing Fish Batticoloa Club on 27th Novemeber 2010 with 26 members. 38th regional convention was held at Global Towers hotel Colombo 6, 22nd June 2013. Best club – Dehiwela. Elected RD – PRD Anton Kandiah. Chief Guest – AP Oliver wu. 41st Regional Convention was held at Hotel Sapphire, Colombo 6, 18th June 2016. Best club – Young Moratuwa Elected RD –PDG Prasantha De Siva. Chief Guest – APE Tung Ming Hsiao. Key Note Speaker - Mr.
42nd Regional convention was held at GOH, Fort, Colombo 1 on 27th June 2017. Best Club – Young Moratuwa. Continued to be RD in the coming year. Chief Guest- AP Tung Ming Hsiao. Key Note Speaker - Mr. Geoffrey Alagaratnam . 43rd Regional Convention was held at GOH, Fort, Colombo 1 on 23rd June 2018. Best Club- Young Moratuwa. Elected RD Ranarajah Serasinghe. Chief Guest – AP Tung Ming Hsiao. Chartering of Bandarawela Y’s Menettes ’ Club and Y’s Youth Club took place during this Y’s year.